Is it true that drinking too much beer will make you fat and end up giving you a beer belly? This is why drinking beer doesn't make you fat. Why is that after having such a good time out on the town week in, week out, and after returning home to find that they are starting to put on noticeable beer belly fat, that most people blame it on the alcohol? You would be surprised what a few drinks can do to your appetite and what that means in terms of keeping your promises with your diet. Have you heard the myth that beer makes you fat? Despite the fat in beer being little close to zero, there isn't a shortage of people asking the question does drinking beer make you fat. For most people the image of beer fat is often associated with the beer belly myth of a fat man drinking beer. The truth about beer and belly fat that it isn't drinking beer that makes you fat. The fat content of beer is almost negligible. So why does beer make you fat. The real culprit being weight gained drinking beer is in fact the appetite for destruction that comes along with it. The phrase beer belly is keyed on the image that beer has for making you put on belly fat. The truth of the matter is that beer isn't the cause of why people get fat gaining weight drinking beer. In fact, it is what happens after you start drinking in the food snack on. That's so drunk diet like, right? The calories in beer or to be more specific the calories in alcohol are what are referred to as empty calories. These calories are known to be less likely to be absorbed by your body. In other words, they are not effectively processed by your body, which makes sense because unlike an engine your body doesn't require combustion to produce energy. It is said that only 15 calories are absorbed in every 100mL of beer making beer low in calories. Considering that there is about 330mL in a regular sized can of beer, what that means is that only 50 calories in beer get metabolized by your body to be used as energy. The bittering components and carbon dioxide gas commonly found in beer affects the lining of your stomach that increases your appetite. Although the calories in beer may be very little, overeating snacks while drinking is said to be one of the leading causes of why it seems like beer makes you fat. After a few drinks, Friend-fries, potato chips, and chicken wings all start to look and taste the same, oh so delicious! What you may not have noticed is that these are all super high calories fried foods. Why is your body telling you to eat such fatty foods? Bitter bears are said to go well with rich-dishes and foods cooked with oil. Drinking beer makes you want to eat these high calories foods. Now that we know beer isn't making people fat, what can be done about excess over-snacking that is going to be the real reason drinking beer is making you fat? Just because you now know that drinking beer along isn't going to be the sole cause behind you gaining weight, doesn't mean you have to lock up your appetite and throw away the key. Now that would be even too harsh to imagine. These are all foods that are perfectly fine to eat even after drinking. Not satisfied yet? 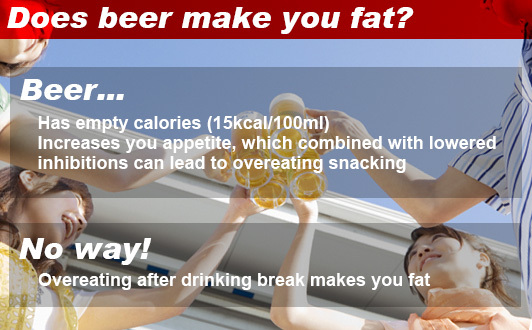 - Here are some more diet tips on drinking beer to help you maintain your weight without having to give up on drinking. How much can you drink? Alcohol has a bad rap when it comes to dieting. Most people believe that drinking will make you fat. Take the best out of the drunk diet and what you will see is that it’s not what your drink it’s what you eat.